Uber Eats is a three-sided marketplace connecting a driver, a restaurant owner and a customer with Uber Eats platform at the center. 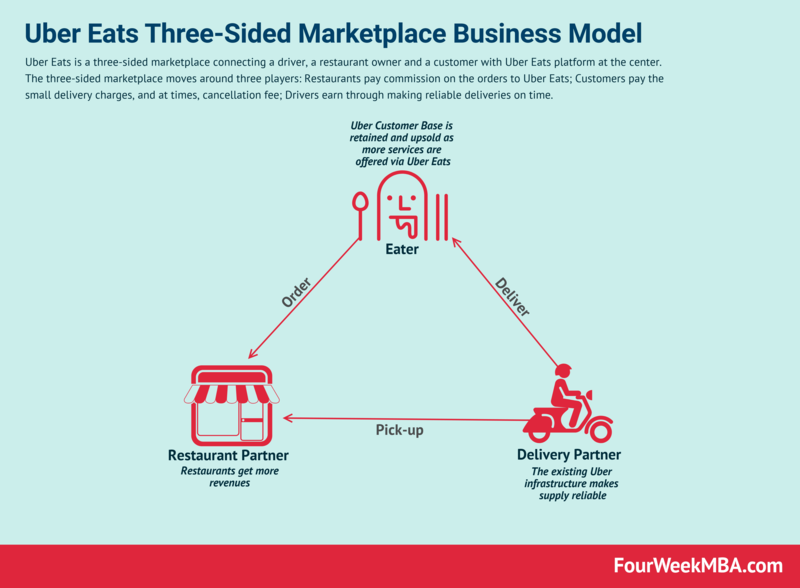 The three-sided marketplace moves around three players: Restaurants pay commission on the orders to Uber Eats; Customers pay the small delivery charges, and at times, cancellation fee; Drivers earn through making reliable deliveries on time. As the founder of Entrepreneur HQ, I’ve looked at how successful entrepreneurs operate. Let’s break down Uber Eats business model. Uber – The world’s largest ride-share company took an interesting turn in 2014 when it gave birth to “Uber Eats,” called initially Uber Fresh. Getting food delivered from your favorite local restaurants became as easy as requesting a ride! Fast forward to today, Uber is heavily investing in the Uber Eats model. The food delivery business is growing fast and gaining momentum around the world. Why is Uber building the world’s largest food delivery platform? Is it valuable for Uber to turn its drivers into a reliable delivery fleet? In this post, you’ll learn why Uber is betting big on the Uber Eats business model, its value proposition, operational components, and what it means for the future of Uber. Uber Eats is a three-sided marketplace connecting a driver, a restaurant owner and a customer with Uber Eats platform at the center. Restaurants pay commission on the orders to Uber Eats. Customers pay the small delivery charges and at times, cancellation fee. Drivers earn through making reliable deliveries on time. No minimum order concept: The customers can order their favorite snack instead of a full meal. The standard delivery fee ensures that all orders are fulfilled irrespective of the order value. Existing customer base: Probably, the most valuable asset of all. They already have millions of active Uber users across the globe who can be potential Uber Eats users. Better utilization of Uber’s resources: They already have cars/drivers on the road and an effective system to manage it. The inclusion of Uber Eats will only help to increase the utilization across Uber’s different verticals. For example, a cabbie who just finished a trip may handle a food delivery order right afterward. A top class algorithm: The algorithm developed by Uber does a great job in neatly organizing the prime factors in online food delivery system. i.e., order management, order allocation and order dispatch. The global presence: How hard it would be for them to leverage Uber’s global dominance to scale the business of Uber Eats? Not that hard! While they may face local competitors in every market they penetrate, a competitor with such a global stronghold would be hard to beat! Standard Delivery Fee OR Convenience Fee: Uber Eats charges a flat delivery fee from its customers irrespective of the order value. The charges vary from $1 to $5 depending on the market they are operating in. Recurring Revenue Share from Restaurant Partners: Uber Eats takes a cut of 15% to 40% on every order that is fulfilled from the Restaurant partners. Uber Eats decides the percentage of the commission depending on the age and maturity of the market. Marketing & Advertising Fee from Restaurant Partners: Uber Eats is helping their restaurant partners attract more customers and reach a larger customer base by offering customer-facing brand campaigns, relatable social posts and email marketing to Uber’s rider base. How much Uber Eats pay for their delivery partners or drivers? The delivery partner’s fee is mainly divided into three segments which are pickup fee, delivery fee and per mile fee also referred to as mileage fee. The exact figures of these charges vary from region to region. A customer can tip the delivery partners if they want to and 100% of this tip would be allocated to the delivery partner only. You’ve heard the saying “Every Penny Saved is Every Penny Earned”? Uber Eats, with its unique three-sided marketplace business model, is both cost-effective and efficient than its competitors. Lesser Customer Acquisition Cost (CAC) and Shared Marketing Expenses: The current marketing and advertising expense incurred by Uber Eats is comparatively less since it’s getting most of its users through cross-promotion on the Uber App. Shared Network of Drivers & Riders: The drivers and riders on Uber double up to work as the delivery fleet, which eases the pain of setting up a delivery network from scratch. Savings on Logistics Costs: A well-defined unit economics helps in saving big on the logistics cost as multiple food orders on the same route can be delivered in a single delivery run. YOU ordered an apple-pie from XYZ restaurant that is priced at $50 Order Value + $5 Delivery Charges. The order will be delivered by ME at your door and ME is currently 3 miles away from your location. Currently covering 50% of the US population, it is set to cover more than 70% by the end of 2019. Uber Eats holds 27.9% of the revenue share of all top online food delivery services in the USA and is approximately valued at 20 billion USD. Uber has been doing a great job in innovating and captivating new markets with its exceptional approach. In a market which is already crowded with online food ordering and delivery platforms, how should we look at Uber’s presence in this space? Is food delivery the real endgame, or are we witnessing the time-honored “sustaining innovation” curve leading to Uber Everything? Only time will tell!